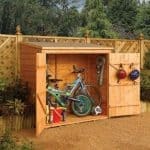 This great compact storage shed comes at a remarkably affordable price. 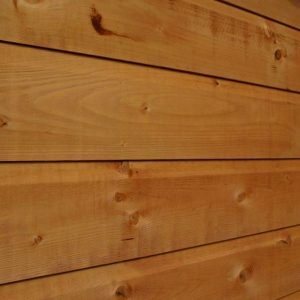 Designed with tough Shiplap cladding, the quality and value for money you receive truly is exceptional. As sold, the building is suitable for light-mid weight storage. However, you do have the option to upgrade to a tougher floor for heavy duty storage. For some of the best 6×4 shed currently on sale in the UK right now why not check out the 6×4 shed award winners. The pent roof is a unique feature. Typically modern storage sheds tend to feature an apex roof design. So if you’re looking for something a little different, this is a great choice. The pent roof still provides excellent drainage, whilst also offering a practical design suitable for assembling underneath a tree, or against a building. Like other Waltons sheds, the roof on this one is also protected with heavy duty sand felt. One small window is included with the building and you can choose which side you want to install it on. It is styrene glazed which means it is safer than glass thanks to its shatterproof design. A single, spacious ledge style door opens out to give you direct access into the building. It also features diagonal cross beams for additional support. They help to stop the door from sagging over the years. A butterfly catch is also included to make sure the doors stay secure, even in high winds. Unpainted design, though this can be easily rectified with a coat or two of paint after assembly. 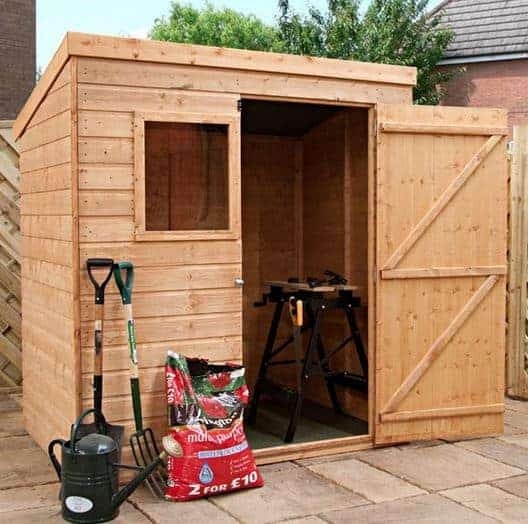 This wooden storage shed comes with a less common pent style roof. Offering a more unique style, this roof offers a number of practical, as well as stylish benefits. Unlike apex roofs, the pent style variation isn’t as tall, which means it can easily be installed underneath low hanging trees, or any place that has height restrictions. Of course, this means you don’t benefit from additional interior height, but it still provides the same great water-resistance. The roof slopes downwards towards the rear of the building. So any water will run down the back, straight to the floor, preventing build up which could cause rot and other moisture-related problems. 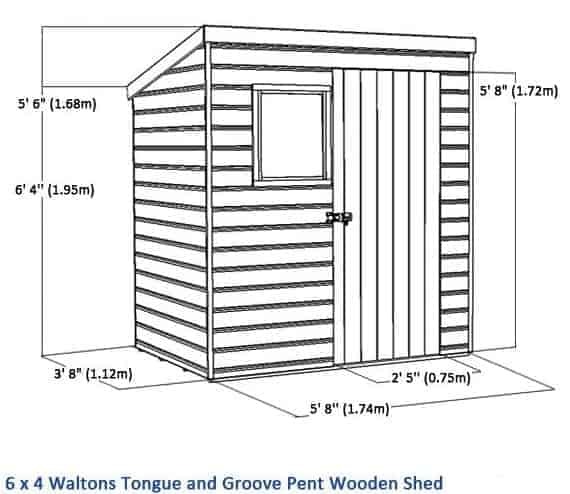 Pent style sheds are designed with compact storage in mind. Therefore this model measures a modest 1.78m wide and 1.17m deep. 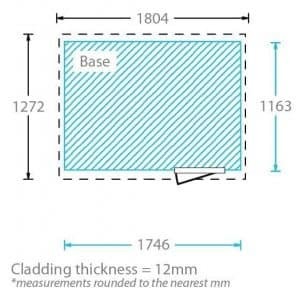 The doors measure 1.73m tall and 0.75m wide. 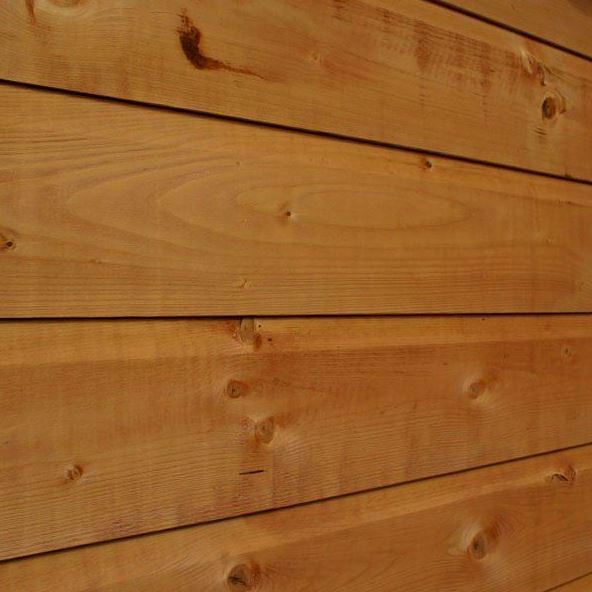 The exterior walls are made with 12mm Shiplap tongue and groove cladding, providing a very solid, tough building. The cladding has a small groove incorporated into each panel which acts as an excellent water-resistant feature. Like the roof, water doesn’t have the opportunity to build up; instead it is channelled away from the building, onto the floor. Another reason why Shiplap is used is to give the shed a more attractive look. You’ll notice this style of cladding generally has an aesthetically pleasing design, offering a more seamless and smooth appearance. It is found on the best quality buildings so that gives you some idea of what to expect. It’s pretty standard to see 28mm x 28mm framing used, though the double framed corners are a unique addition from Waltons. 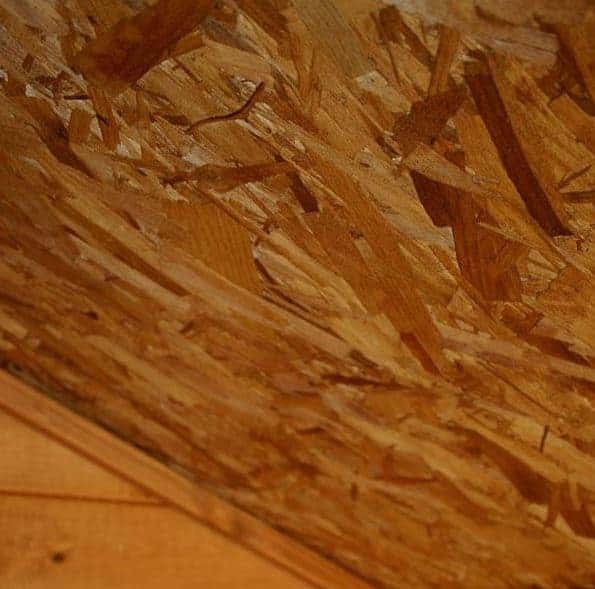 This basically adds a lot of extra moisture protection, as well as giving the shed a stronger overall support. To keep costs down, a solid sheet material floor has been added, rather than a tongue and groove floor. Measuring 10mm thick, this isn’t the strongest floor out there, but it’s strong enough to hold most gardening essentials. A free 26mm support pack is also included which is a really nice feature. As long as you are only thinking of storing medium weight items, you will find the support pack more than adequate to hold everything securely. Prior to, or shortly after construction, a high quality treatment will be needed. So that the shed arrives to you in the best possible condition, Waltons will have used a water based treatment. This isn’t going to protect it for an entire year however. You basically have two choices when it comes to treatments. The first and most affordable is a water treatment. These come in numerous different shades which make them ideal for those hoping to add a different colour to the shed. They also provide a pretty strong water protection barrier on the surface of the timber. However, they always need to be applied annually. The second option is a spirit treatment. Slightly more costly, these treatments don’t come in the same colour variations as the water treatments, but they do give much more protection. This is because the ingredients soak through into the inner layers of the timber, helping to protect not only the surface, but inside the wood too. They also often provide much longer protection and won’t need to be reapplied every year. However, this does depend upon the type you buy as every manufacturer is different. So double check the instructions before you choose one. A 10 year anti-rot warranty comes with the building, though it is vital you maintain the treatments in order to benefit from this. This building benefits from quite a wide door. It has also been built with supportive cross beams which run diagonally down the door’s interior. This is a pretty important feature as it will prevent the door from sagging. It benefits from the same solid construction as the rest of the building and offers a brilliant amount of space to move equipment into and out of the shed. 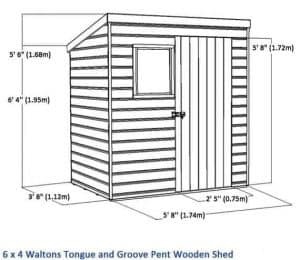 You’ll notice on the Walton’s website it shows the shed with a bolt. This doesn’t come as standard. Instead what you do get is a butterfly catch. 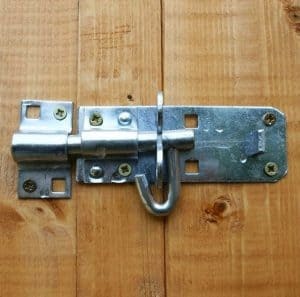 Also known as a turn button lock, this is a small feature which helps to stop the doors blowing open when the shed isn’t in use. One small window is included at the front of the building and we feel this gives it a slightly more attractive design. Instead of glass, this window is glazed with 2.5mm styrene known for its 100% shatterproof benefit. The fact the shed does have a window would usually compromise its privacy quite a lot. However, as it is fairly small, it doesn’t pose too much of a problem. You can always keep valuable equipment covered up. Or you can opt to install a blind which would allow you to allow natural light into the shed when you need to and keep your valuables protected from view when you aren’t around. We have mixed feelings about the security of the building. On the one hand you have a very solid, thick cladding which is extremely tough to break into. So the overall structure itself does provide a strong, secure building. However, as it doesn’t come with an included lock, we would suggest you buy one separately. If your garden isn’t very open to the public and it’s secure, you might be able to get away with just keeping the butterfly catch. However, it’s definitely worth the peace of mind to install a lock; especially as they aren’t very expensive. You have two customisation options with this shed. The first is a higher quality, superior duty roof felt. Available in a choice of olive green or charcoal, this self-adhesive felt is made from tough fibreglass and offers a long lasting, water resistant barrier. The heavy duty sand felt you receive with the shed does supply a lot of protection, though we find it is a little flimsy and therefore likely prone to damage over time. So the superior felt does give you more reassurance in the unpredictable British weather. Your second option is to add the extra strength floor support. If the shed was purely supplied with just solid sheet material, we would definitely recommend taking advantage of this extra strength support pack. However, as it already comes with a free 28mm support pack, unless you need to store anything heavy, you may not have to spend any additional money. Obviously it will give the floor a much tougher feel and give you the option to store whatever you need to, but if you’re trying to avoid spending extra money, the free support pack included could be sufficient enough to suit your needs. You have quite a lot of extras to choose from, though you’ll find some are a lot more useful than others. A common extra we often recommend is the 49mm padlock with its incredible weatherproof design. This will help to solve the potential security risk that the shed poses due to not having an actual lock installed. The padlock is supplied along with a hasp and staple and it uses a double locking mechanism. Despite being offered at a pretty low price, this lock is built with extreme durability, security and longevity in mind. Did you know that one of the most important things to think about when buying a shed is the base it will be installed upon? If you want to make sure it lasts as long as it should, you need to assemble it ideally on a concrete surface. If you don’t have a concrete base available, the 6×4 Waltons Portabase is an excellent alternative. 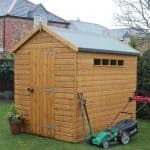 This hardy, firm and more importantly, level base, makes it easier to build the shed, as well as ensuring it is left with an extremely stable design. Though the walls of the shed are strong enough to attach internal shelving, you could save time and hassle with the 3-5ft shelving sets available. Three of these kits come with a two-tier design, while one comes with three tiers. 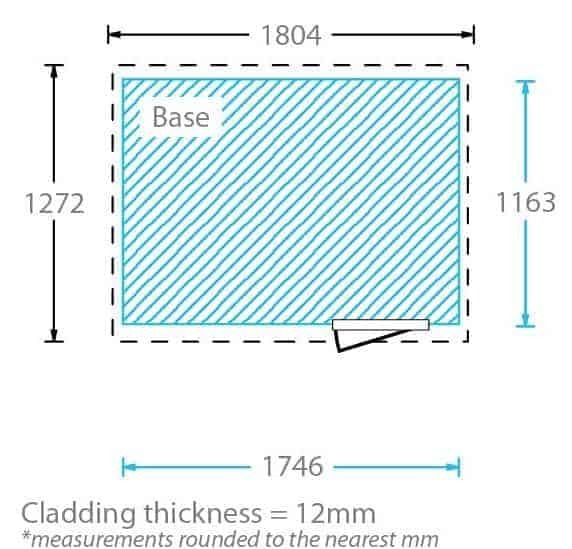 They feature supreme quality 16mm tongue and groove construction and they have a stand-alone design, meaning you just slot them together and place them on the floor. The final two extras on offer are treatments and Draper accessories. Whilst the shed does need treating, it actually comes with a free 5L Golden Brown treatment. 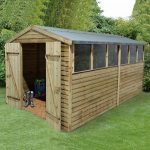 The majority of this shed has been created with excellent quality Shiplap cladding and a sturdy frame. The solid sheet floor is a little bit disappointing, though Waltons do supply a support pack so this adds to its overall quality. The exterior of the shed has a naturally long lasting design thanks to the Shiplap used. However, it does require continual treatments in order to ensure it stands up the often harsh British weather. Being more of a small sized building, you are limited to what you can store in this shed. Therefore it is recommended to those who don’t have an overly large amount of items to store. The shelving sets available and the ability to install shelves on the internal walls does add to its storage potential which we feel is a great benefit. Installation is pretty easy which is definitely a highlight of the shed. If you invest in the Portabase you’ll also find it even easier. Even though it’s quite small, it will still take a few hours to construct and we always recommend using two people throughout the assembly process. Overall you do receive great value for money, but you do need to take into account the cost of any extras needed, as well as long term treatments. The two free gifts provided (Golden Brown treatment and floor support pack) add to its value for money and the fact it is also built to last is another great advantage. 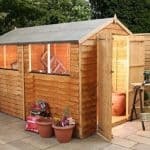 Final Thoughts: This shed is an ideal choice for those with limited space capabilities. The small styrene glazed window lets in a generous amount of natural lighting, while the tough, stylish Shiplap tongue and groove cladding provides a durable, sturdy build. 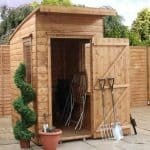 Though it does require annual treatments, this shed provides great value for money. It is an affordable choice for those on a budget. The solid sheet floor may not be strong enough for heavyweight storage, but you do have the option to upgrade. You can also alter the colour of the building with either coloured treatments or paint. 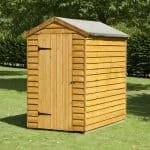 All in all this is a fantastic compact shed that provides plenty of storage potential.